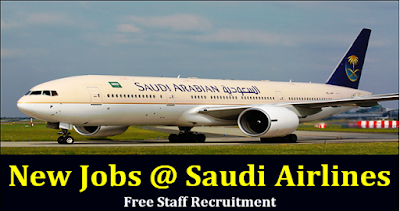 Job Vacancies at Saudi Arabian Airlines. Saudi Arabian Airlines, also called Saudia, is Saudi Arabia's national airline with its operational base at King Abdulaziz International Airport in Jeddah. It also has two secondary hubs in Dammam and Riyadh. As the third biggest airline in the Middle East, this airline operates both international and domestic flights to more than 120 destinations across Africa, the Middle East, Asia, North America and Europe. With a history dating back to 1945, Saudi Arabian Airlines is now a prestigious employer, so if you are looking for job vacancies at Saudi Arabian Airlines you will find that there are plenty of roles at all levels of experience and across a wide range of sectors. Saudi Arabian Airlines has a program for future pioneers which qualifies graduates to work in the air industry through extensive training in the fields of finance, marketing, accounting or management. This two year program offers trainees excellent financial recompense as well as uniforms, travel tickets, medical insurance and books. There are both permanent and temporary positions available as well as full time, part time and contractual positions. The first place that you should start your search for job vacancies at Saudi Arabian Airlines is to visit the website's own careers portal. This is where you will find a comprehensive listing of all of the currently available posts with this employer and also be able to apply for positions through this portal. In order to view the listings, however, you will need to register for the site and set up your own profile. If you perform an internet search for job vacancies at Saudi Arabian Airlines you will find a number of general job listing sites like Indeed, GulfTalent and GulfJobCareers which claim to have listings for this employer, however when you click on their pages they will redirect you back to the Saudi Arabian Airlines website where you will need to register anyway. After you have registered for the Saudi Arabian Airlines careers portal you can complete your own personal details and attach your most up to date resume. This will give you access to all of the current job listings for this employer and you can then apply directly online by using your profile. What Skills Are Necessary To Work For Saudi Arabian Airlines? The skills and qualifications necessary to work for Saudi Arabian Airlines will, of course, vary between different posts, however the minimum standards is a good high school certificate. More senior posts will require industry specific qualifications and usually several years of experience in a similar post whereas lower level posts may not require any relevant experience. Good communication skills are important as is a strong work ethic, and customer service skills are also important for any job which has contact with the public. For many posts, good computer literacy is essential, and cabin crew posts will have specific requirements regarding height, appearance and swimming ability.